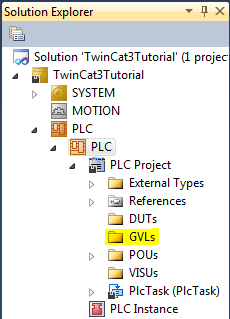 TwinCAT 3 gives you a lot of options about how to organize the data (whether boolean, integer, floating point, string, or user defined data) in your PLC project. As with any PLC project, you want your data structures to follow naturally from the actual machine it’s controlling. I think we can all agree that Infeed.Conveyor.Running is easier to understand than bit. If you’re coming from the RSLogix 5000 world then you’re probably already familiar with the concept of global vs. local variables. A ControlLogix has “controller scope” and “program scope” tags. Essentially “controller scope” tags are global (because every program can see them) and “program scope” is local because only the program they’re defined in can see them. 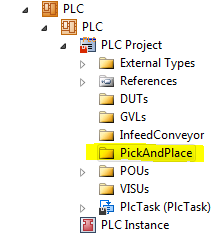 It’s also pretty common to come across PLC projects where all the tags are declared in “controller scope”. What do I mean by “Interlocks”? When you divide up your program, you typically divide it into modules that physically match your machine, so you might have a program for the Infeed Conveyor, one for the a Pick & Place, and one for a Robot. Most of your Infeed Conveyor logic shouldn’t care about the Pick & Place logic, except that you might want to prevent the Infeed Conveyor from running if the Pick & Place isn’t out of the way of the conveyor. In that case, you probably want to create a global PickAndPlace.ClearOfInfeedConveyor variable. The Pick & Place logic is responsible for setting this using a coil, and the Infeed Conveyor logic uses it to prevent running the conveyor. This is an “interlock” signal and since two different programs need to access it, then it’s a good candidate for a global variable. You’ll also notice that everything accessible from an HMI is also global. This is just my preference. You don’t have to do that… an HMI can access local variables, but since an HMI-accessed variable is kind of like an interlock, I like to give them Global status. When someone is reading or modifying your PLC logic they’ll tend to make the assumption that Local variables are only accessed, well… locally. That means when they want to make a change, they’ll only check for usages of the variable within that local scope. Checking the HMI for references to that variable is much harder. That’s why I suggest making HMI-accessed variables Global and also indicating with a comment that they are accessed from the HMI. “GVL” stands for “Global Variable List.” It’s Beckhoff’s intention that you should put all your global variable lists in the GVLs folder, but I think that’s incorrect. The organization and structure of your PLC project should mimic the physical and logical organization of your machine. Let’s continue our example of a machine with an infeed conveyor followed by a pick & place. If those are two major components of the machine, then that’s a logical way to break down our logic and data. I used two digit numbers because that will allow it to sort correctly from 01 through 99. Don’t worry about needing to insert one later as renumbering even 10 or 20 folders doesn’t take very long. The line starts with the variable name (NoPart). Typical variable naming rules apply, so you can’t start the name with a number, and you can’t have spaces or special characters in the name, except an underscore. Here I’ve used the PascalCase way of writing the variable, by sticking capitalized words together. You don’t have to use PascalCase, but you should pick a consistent way of naming your variables and stick with it. A note on how much memory each one takes: for anything that says “8-bit”, “16-bit”, “32-bit” or “64-bit” then the memory usage is 1 byte, 2 bytes, 4 bytes, or 8 bytes respectively. A BOOL could be represented by a single bit, but takes a full byte (this is for performance reasons). There is also a rarely used data type called BIT which uses a single bit, and can have the values 0 and 1, but this is not equivalent to a BOOL. A STRING takes 81 bytes (80 for the characters and 1 for the null terminator) and a STRING(n) takes n+1 bytes. Beckhoff’s Infosys site has more information about TwinCAT 3 Data Types. After the data type, there is a terminating semi-colon (;). The compiler stops reading here. After the semi-colon you can put an optional comment ((* Through-beam sensor *)). There are two ways to insert comments: you can enclose them in bracket-asterisks, as I did, or you can preface them with a double-slash (//). Note that comments will show up as tool-tips when you hover your mouse over any use of this variable in your logic, so they are helpful. The other thing that shows up in a tool-tip over a variable is the data type (BOOL, INT, etc.). Long before we had helpful features like this in our IDE, programmers invented a system for embedding the type of the variable in the variable name called Hungarian Notation. You will often see TwinCAT code examples, even in the official documentation, that use Hungarian Notation (such as bIsTRUE : BOOL;). This is now discouraged thanks to smarter and more helpful editors. In general you should avoid Hungarian Notation in your TwinCAT 3 programs. 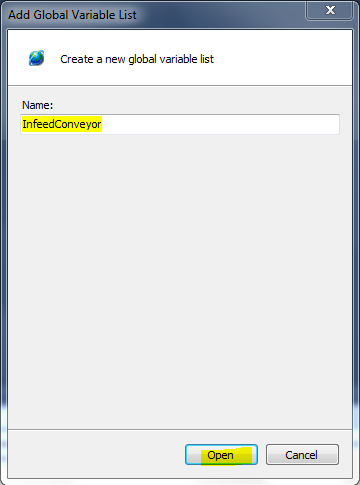 When you refer to global variables in your logic, you should use the fully qualified name of the variable (including the Global Variable List name) such as InfeedConveyor.Run. Technically it will let you omit the Global Variable List name and just use the variable name (Run). This is a throw-back to TwinCAT 2 where there was only one Global Variable List. You don’t want to run into a situation where it gets confused with another global variable called Run in another Global Variable List (OutfeedConveyor.Run would be an obvious one). If you happen to do this, the compiler will give you an error telling you that you have an ambiguous variable name and it will force you to use the fully qualified name. I suggest using fully qualified names for all global variables. A conveyor is a pretty simple piece of equipment and I doubt you’d want to break up the structure of the InfeedConveyor Global Variable List into smaller pieces, but for a larger part of the machine you might want to. For instance, the pick & place might have two positions (Pick and Place). Rather than having variables such as PickAndPlace.InPickPosition it’s a bit nicer to have PickAndPlace.Pick.InPosition (I realize some of the reasons why it’s nicer might not be obvious at this point, but trust me). 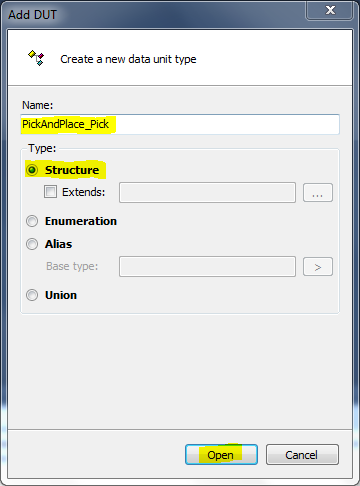 Now we’ve created a variable called PickAndPlace.Pick.InPosition. Note that you can also define inputs and outputs inside your structure (by adding AT %I* or AT %Q* respectively). To use this array in your logic, it would look like this: ExampleGlobalVariableList.SomeArrayVariable. That would be the first element. The last element in the array would be ExampleGlobalVariableList.SomeArrayVariable. Note that the syntax ARRAY[lower..upper] OF allows you to define any lower or upper bounds you like. Unlike a language like C, your lower bound doesn’t have to be zero. The total number of elements in the array is upper - lower + 1. You could access the first element of the array like this: ExampleGlobalVariableList.SomeArrayVariable[1,50] and the last element as ExampleGlobalVariableList.SomeArrayVariable[10,55]. Caution: when some programmers graduated from RLogix 500 to RSLogix 5000 and were first introduced to tags, they just didn’t “get” it. They wanted their nice safe B3:0/5 or whatever. Since the concept of tags was confusing, they just created a big controller-scope array tag called bits and used bits, bits, bits, etc. in their logic. It was a bad idea, but doing the same thing in TwinCAT 3 is a really bad idea. At least in RSLogix 5000 you could add a useful comment for each element of the array but there is no method of doing that in TwinCAT 3 (because you’re not supposed to do that anyway). Your TwinCAT 3 program would be completely incomprehensible. Perhaps you would like to implement that auto sequence using the Step pattern. Good idea. Now you might think you want to create an array of variables for your steps, such as PickAndPlace.AutoSequence.Step. Having done this in the past, I now think it’s a bad idea. It’s very common to have to modify your auto sequence to add or remove steps in the future. What if between your pick and place step you wanted to add a measurement step? It’s not so easy to add a step 2.5 when you’ve declared them as an array, and renumbering the steps in all your logic can be a real pain. I think it’s better to create variables like PickAndPlace.AutoSequence.PickStep and PickAndPlace.AutoSequence.PlaceStep. Then you can add and remove steps, or even re-order them, without cursing yourself later. You might notice that some of my variable names above end up very long. I agree that’s a problem. On the one hand, since the comments for each variable only show up if you hover your mouse over the variable, you shouldn’t make your variable names too cryptic or it will be hard for someone to understand your logic. On the other hand, if you make them too long, you can’t fit enough of your ladder logic on the screen at once, and the logic itself becomes difficult to follow. There’s a trade-off to make in conciseness vs. readability. I suggest making short codes or acronyms for your top level machine elements. 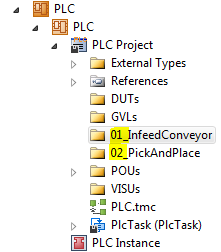 For example, you could abbreviate InfeedConveyor as IFC and PickAndPlace to PP. When someone looks at your PLC project, they will still see 01_InfeedConveyor and 02_PickAndPlace as two folders, and inside each there will be Global Variable Lists IFC and PP respectively. Since you’re only doing this at the top level of your program, and it’s fairly easy for someone to see the relationship of the full name to the abbreviation, I think this is a good way to shorten your fully qualified variable names without sacrificing much readability. For the lower level variable names, make an effort to pick names that are still concise but convey the meaning to the reader. Yes, it takes practice and there’s no perfect answer, but effort really counts here. This chapter is part of the TwinCAT 3 Tutorial. Continue to the next chapter: Persistent Variables.